My first encounter with coalition work began when I was in the 7th grade. It was a random Tuesday and my guidance counselor approached me and two other friends asking us to join a substance abuse coalition. Aside from knowing that it was an issue in my community, I did not know much about alcohol and drug awareness. Once I began attending the coalition’s meetings, my understanding of the different types of substances in my community widened and my eagerness to make positive community change increased significantly. Since then, I have made it my goal to reach the minds of my peers and fellow community members and spread the message to reduce the amount of underage drinking and marijuana use in Orange, New Jersey. What substance abuse issues do you see in your community? The most prevalent substance abuse issue that I see in my community is alcohol. It is something that over the years was deemed to be normal, and people believed that most youth picked up this habit. In addition to this, marijuana and tobacco are also huge substance abuse issues. These substances are considered community norms and peer pressure plays a vital role in one's first experience with alcohol and marijuana. How has your coalition addressed some of these issues? What is the youth involvement in your coalition? How do you think youth can make a coalition stronger/what can youth bring to the coalition table? My coalition, Alcohol and Drug Abuse Prevention Team (ADAPT), has addressed the alcohol issue in my community by reaching out to local liquor stores and spreading the message to retailers to not sell to minors. We have also developed strong relationships with local high schools, which gives us the capacity we need to implement our initiatives. We also attend different training events, such as Mid-Year, to promote more awareness about leadership to our own youth leaders. Similar to CADCA, both of my coalitions believe in having the youth be the leaders on all projects that we do. Although my coalition also includes adults, our main message is centered around creating a platform for youth to voice their concerns. It is vital for the youth to understand their importance in coalition work and without them, it would not be as rewarding. The youth bring to the table a unique perspective that is very unlike that of adults. As youth, we see firsthand the way drugs affect our communities and we provide new ways and methods to fight this issue. What substance abuse prevention projects or campaigns have you been involved in? My local coalition, ADAPT, does many sticker shock campaigns in different towns in our county and our campaigns hold the message, “Hey You! 2 Minutes In a Liquor Store Can Buy You Up to 6 Months in Jail, Don’t Buy Alcohol for Minors!” and it reaches our community in a positive sense. These campaigns stress the importance of not having retailers sell to minors, and youth realize the consequences of underage drinking. My statewide coalition, New Jersey Prevention Network (NJPN), utilizes Photovoice to highlight the positive and negative images youth and other members of the community witness. Positive images would include We Card 21 signs and youth in their coalition meetings. Negative images would include loose cigarettes and/or alcohol bottles. I think both outcomes impact my community positively; however, the best outcomes would have to be our sticker shock campaign. It engages the community, builds relationships with the youth and adults while spreading positive awareness about substance abuse. What is your favorite part of being part of the CADCA family/being a CADCA trainer? 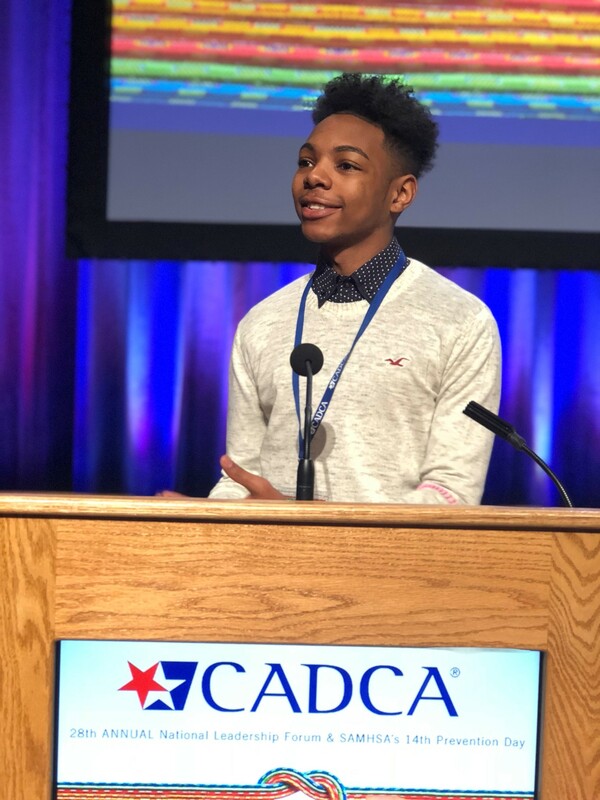 While there are many rewarding moments that come from being a part of the CADCA family, I would have to say meeting new people at different conferences is my favorite part. When talking to the youth, I realized that even though each person has their own story, we all share a common mission, to better our community. The Youth Leadership Team has given me the opportunity to grow as an individual and promote positive community change throughout my hometown. My involvement in this extracurricular activity has helped me form more interpersonal relationships with youth throughout the nation while helping me stay true to my roots. I realized that I wouldn’t be the person I am today if I wasn’t a part of CADCA; the beauty and complexity of this realization will leave me awestruck for as long as I live. What advice would you share with youth your age? One piece of advice that I would share with youth my age is that it is okay to be afraid. Being afraid of new opportunities, who you are, and becoming the face of change is the first step towards success. When you take the first step out of your comfort zone, the opportunities are endless. In addition to this, a message I would share with youth my age is that we all have a purpose in life and how we go about reaching our destiny is up to us. Yes, it is okay to take advice from others and to have guidance from those we look up to, however, at the end of the day, our decisions affect how our future will turn out. So, grab the bull by its horns, guide it down the path of positive social change, and be the leader you are destined to be.